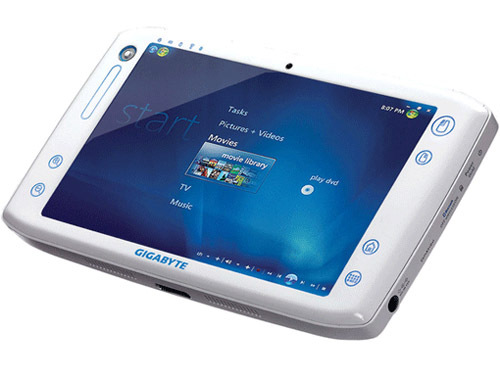 Previously, we have discussed about Tablet or Netbook : Which one to Buy? ; this time, we are going to discuss about a bit more smaller device: UMPC. UMPC Ultra Mobile PC comes from, and simpler explanation would be that it is a computing device that provides the functions of a laptop and the portability of a PDA, UMPC standing in an intermediate size between the two. Use of UMPCs is still limited, since the advent of netbooks and prices have diverted some attention from these ultra-portable notebooks. Generally, a UMPC is used by a person who travels a lot and need portability and performance, or the user often uses it as connecting PLC in laboratories, warehouses, etc. Among the UMPC models available in the market, we can choose UMPC with or without a physical keyboard. In the case of carrying physical QWERTY keyboard, in most cases these are manufactured in slide format, ie, the keyboard slides down when we use it, and integrates seamlessly with the UMPC when working on touch mode. 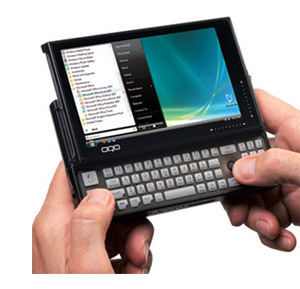 Unlike PDAs and Smartphones, UMPCs do not need special versions adapted to run Windows 7 operating system or browsers. 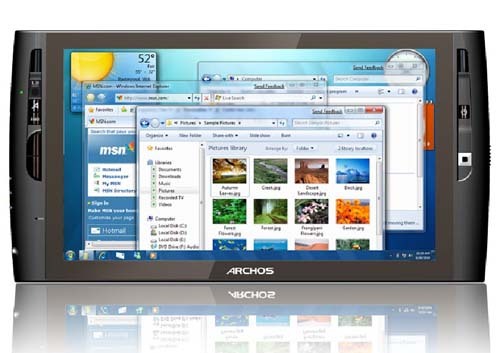 You can install Windows Vista, Windows 7 on an UMPC , as for example the Archos 9 in above picture. It has power and performance far superior to any PDA or Smartphone. The new UMPC models provide battery backup for up to 10 hours, surpassing almost any laptop today. Ports provide connectivity for use on desktops with conventional keyboards and mice. Buying an UMPC may be cheaper than many PDAs, Smartphones netbooks, beating well the relations between mobility and performance. As with other touchscreen devices without physical QWERTY keyboard, an UMPC may be uncomfortable at the time of writing a document of several tens of characters, because the virtual keyboard presented by these devices, can never be compared (the least for now) with current conventional physical keyboard. Not fit in a pocket, since its size may come to be similar to a sheet of foil, a calendar, etc. The power of an UMPC is high, although it remains below a conventional laptop. For now, buying an UMPC can be tricky, since currently there are few alternatives in the market and the price of a UMPC could increase to about 600 USD, sometime up to 1200 USD. The UMPC is possibly the future of ultraportable computers, each day is passing, we are seeing the success and trend to similar non Windows 7 devices like the iPhone 3G. An UMPC change the current laptop concept, especially as far as leisure is concerned. It is equally or more powerful than a netbook when viewing videos, photos, Internet browsing, etc. The avant-garde designs and UMPCs offer mobility, are undoubtedly one of the key ingredients to become quickly in the personal computer par excellence, without forgetting that its autonomy and ability to deliver an operating system like Windows 7. This Article Has Been Shared 1208 Times! Tablet or Netbook : Which one to Buy? While choosing among Microsoft Windows 7 capable mobile computing devices, new users often get confused which one is a better option: Tablet PC or Netbook.Here is an article which will help to take the decision. Cite this article as: Abhishek Ghosh, "UMPC: Advantages and disadvantages," in The Customize Windows, December 28, 2010, April 18, 2019, https://thecustomizewindows.com/2010/12/umpc-advantages-and-disadvantages/.